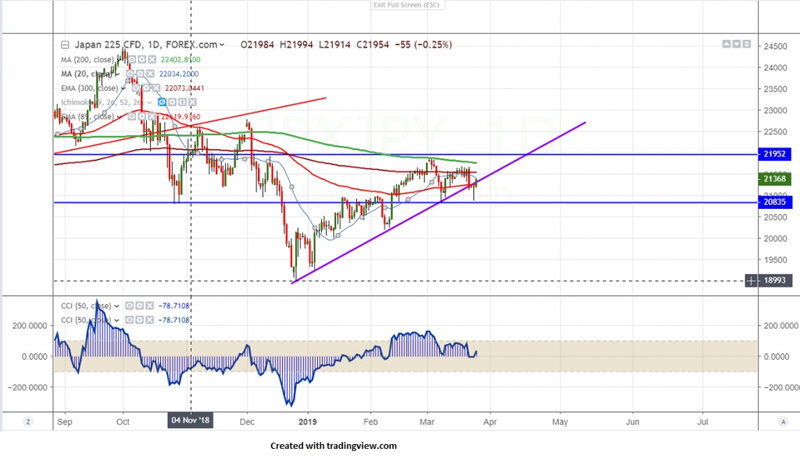 Asian markets recovers sharply especially Nikkei has jumped more than 2% on short covering.Global markets shown a massive sell-off yesterday on declining bond yield . US 10 year yield hits 2.37% yesterday lowest level since 2017. US 3 month and 10 year yield has inverted for first time since 2007. USDJPY has halted its weakness and shown a minor recovery above 110. US markets has closed flat with Dow Jones at 25516 (0.06% higher) and S&P500 2798 (0.08% lower). Nikkei recovered more than 500 points from low of 20878 and is currently trading around 21378. The near term resistance is at 21440 (20-day MA) and any break above targets 21680/21765 (200- day MA). It is good to buy on dips around 21000-050 with SL around 20800 for the TP of 21440.